Devan Wilfong was 15 when he got three nails forming a cross tattooed on the inside of his left forearm. Five years later, he doesn't want it anymore. He's still a Christian, Wilfong says, but he now thinks the second cross he has tattooed on the back of his right calf is enough. So he's sitting at the back of a downtown tattoo parlour about to undergo the painful process of having the other one faded -so he can have an even bigger tattoo inked over it. An outline of the new Super Mario "sleeve" that will cover his entire left arm already runs over parts of his old tattoo. It's a tribute of sorts to his dad, who died when Wilfong was six. "We really got into gaming before he passed away and I still play a lot," he says. "It's kind of always been a family tradition to play video games." But what if he doesn't feel the same way about this new tattoo in another five, 10 or 20 years? "I understand where you're coming from with that because I'm getting something taken off to get something even bigger, but I appreciate the art work that goes into the tattoo as well," Wilfong explains. Not everyone with "tattoo regret" wishes they had never got one. About half the clients who seek out Ben Alway really like tattoos. But what they thought was cool at 19 may not be cool now that they're a parent with two kids, he says. Alway is a certified laser technician and owner of Second Skin Tattoo Removal. He removes and fades tattoos in a little backroom within feet of people being inked at Urge 2 Tattoo Studio, in the front. "I'm not anti-tattoo," says Alway, 41, who is himself heavily tattooed. "My motivation is the same as a good tattoo artist's: I want people to be happy and excited about their body art. If they have a tattoo they're not happy with, that's when a laser can really help out." Besides changing taste, people have tattoos removed or faded because they're no longer with the person whose name is inked on their neck or arm; it seemed like a good idea at the time; the tattoo hasn't held up over the years; or it wasn't done very well in the first place. "I don't see a lot of good tattoos in here,"
On the day that he starts to fade parts of Devan Wilfong's cross tattoo -the process almost always requires more than one session -Alway also begins to remove a tattoo for Jenn Desan. "I was young and dumb and I got a tattoo in the wrong place," she says laughing. Desan is now 29 and the mother of two, and the tattoo, smudged by time, is "ugly," she says, and has no meaning to her, so she wants it gone. "I'm also not so out there now and don't want to be noticed as much, I guess," she explains. 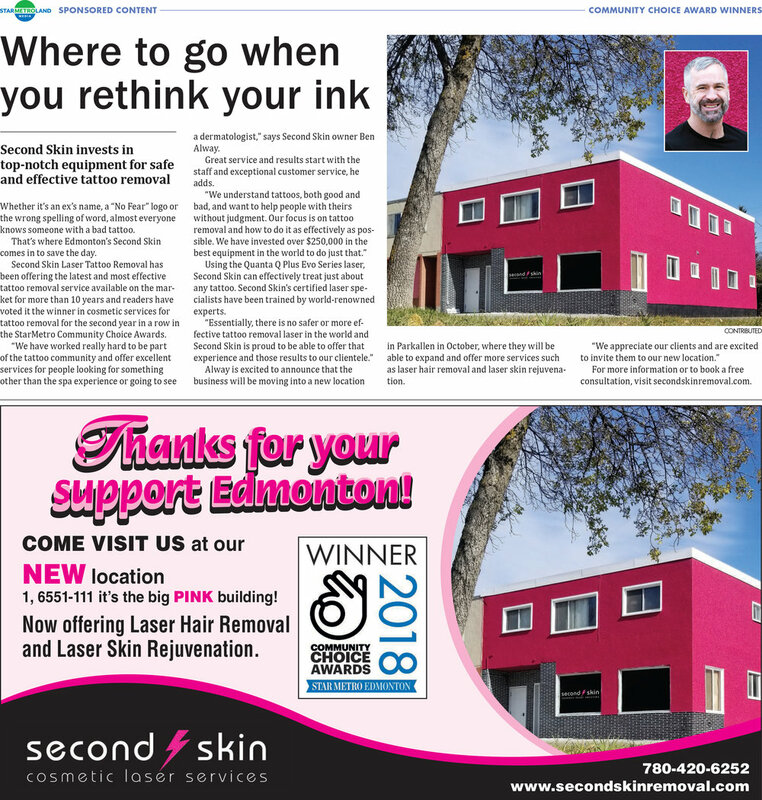 Almost half of people under age 45 have a tattoo these days, so there's no use telling someone not to get inked, says Edmonton dermatologist Dr. Gordon Searles, vice-president of the Canadian Dermatology Association. "I may as well talk to the wall, because if you're going to get one, you're going to get one. "What we can say is if you are going to get a tattoo, or have one removed, make sure the person doing it knows how to do it safely and knows how to do it properly. Make sure they're using sterile materials and they practice sterile technique so you don't contract HIV, or hepatitis C or hepatitis B from contaminated needles," Searles advises. After you get a tattoo or have one removed, you have an open wound that has to heal, "so there is always a risk of secondary infection, so you need to use proper dressings and protect the area," Searles adds. There is no exact number describing the percentage of people with "tattoo regret" who want/have their tattoos removed like Desan, or faded like Wilfong. But Alway, who sees four or five clients a day, is one of several people in the city removing tattoos, including several dermatologists. Different wavelengths of laser target different shades of ink under the skin, heating it up and breaking it apart into droplets that are absorbed over time by the body and the sun. There's a snapping sound with each firing of the laser and a slight smell of skin burning. People can be left with permanent scarring, Alway says, but the risks of that depend on the tattoo and the skill and training of the laser operator. On average, a session lasts between five and 10 minutes. Desan's tattoo took 703 laser shots, Wilfong's took 642, and while both found it painful, they said it didn't hurt as much as they thought it would. Desan, who works in construction, has three other tattoos that she'd like to have removed eventually, including another heart and rose tattoo on the side of her stomach. If you're thinking about getting a tattoo, really THINK about it, she advises. "Nothing against tattoos, but choose something that has meaning to you, that you're not going to get sick of."